Goldberg’s music plays to start the show. He takes his time walking to the ring, starting from way back in the backstage area. Goldberg gets on the mic and compliments Kevin Owens on how good he looked last week. He also complimented Owens on his talking abilities. Goldberg says he won’t talk and talk and talk like Owens did (though he continues talking after saying that). Goldberg says that he’s six days away from winning the Universal Title and going on to Wrestlemania to face Brock Lesnar. He makes a promise to won on Sunday and says he’ll see Owens there..
Kevin Owens then comes out to the stage. He says he got a lot of things off his chest last week, but there was something missing: Goldberg. Owens made a promise as well. He promised himself to dominate WWE. He then lists his accomplishments in his time on the main roster while Goldberg condescendingly claps. He then tells Goldberg that he’s next. Next in the evolution of the Universal Champion. Goldberg compliments Owens’ speech, but it pissed him off. He suggests they fight right now. Owens seems to like the idea, but then he remembers that he’s in Green Bay. Green Bay doesn’t deserve to see Owens fight. New Day heads to the ring. On their way, they talk about their long-awaited ice cream, New Day Pops. The Shining Stars then come out for the next match, but Xavier Woods is handed an envelope. Woods has some bad news, The Shining Stars have a match later on with Big Show. Woods then opens the envelope to reveal that New Day actually has a match right now with Mahal and Rusev. Pretty good match. Woods was in trouble for most of it, but he got some pretty good moves here and there. Big E played cleanup and hit some good power moves. Mahal and Rusev looked pretty good as a team, but Rusev stood out late in the match with a massive kick to the side of Big E’s head. Big Cass listens to Enzo Amore talk about winning the tag titles. Cass reminds Enzo that they’ve never won a tag title together, but that will change on Sunday. They just need to focus. Sheamus is angry at Cesaro for not being angry about not having a tag title match. Samoa Joe walks up and comments on Cesaro still trying to find his place in the company. Cesaro tells Sheamus he can handle Joe. Stephanie McMahon attempts to apologize to Mick Foley. In doing so, she says that Mick is a weak shell of his former self. She apologizes for expecting him to be the great man that she thought she was hiring. Brian Kendrick recounts the two lessons he has taught Akira Tozawa so far. Pretty good match. Tozawa started off fast and strong. He dominated Dar and looked like he had him completely off balance. Ten Noam Dar slowed the match with a trip off the ropes that looked like Tozawa landed completely on his face. Dar maintained control for a little while, but Tozawa got his speed back up towards the end of the match. A lot happened in the short time the match was going on. After the match, Brian Kendrick attacks Tozawa from behind. He gets Tozawa in the corner and kicks his head into the ring post. That was lesson three: the match isn’t over even when it’s over. Samoa Joe asks Mick Foley if he’s having a nice day. He isn’t. Foley tells Joe that he used to be his biggest fan, but now he’s just Triple H’s puppet. Joe says that no one tells him what to do. Foley then tells Joe what to do. He has a match with Cesaro tonight. Charlotte and Dana Brooke head to the ring. Charlotte gets on the mic and calls Bayley selfish for not relinquishing the title last week. She says Bayley is an average, one-hit wonder. Charlotte starts listing some one-hit wonders when Bayley’s music interrupts her. Bayley tells Charlotte that she has achieved one dream, but she’s not done. She’s moving on to her next dream: defending the Women’s title at Wrestlemania. Charlotte tells Bayley she’s going to crush her dreams at Fastlane when Sasha Banks heads to the ring. Sasha says that Bayley deserves to hold the title much more than Charlotte. She’s also exhausted from looking at Charlotte’s “stupid face.” But she’s tired of talking. Sasha wants to get to the next match. Not a great match. It got better as it went along, but the first half was pretty awkward. Nia Jax spent a lot of time in the ring in the first part of the match, and she seemed off. She was too stationary, and there was weirdness with some of the exchanges with Bayley and Sasha. There was also a tag between Bayley and Sasha (involving Nia) that was awkward for seemingly no reason. And Dana Brooke got involved with yet another awkward moment where it was unclear if she interfered or failed to interfere. After the commercial break it was better, probably because Charlotte was in the ring more. The match was okay from then on, but it never got great. Mick Foley tells Braun Strowman that he can’t give him any competition tonight. Strowman doesn’t want competition though, he wants a contract to fight Roman Reigns at Fastlane. A pretty good match. Both guys had a lot of energy and showed a good amount of speed and power. They both felt like they were going full speed for the duration of this short match. Nothing too surprising here, but the finish was fine. It was a good warm-up for the title match at Fastlane, though it didn’t add anything new to the story. I’m not sure if there was any point to this, but it was enjoyable. It was barely a match though. It was really all about Titus O’Neil being supremely aggressive which was nice to see. They first showed a video of Titus offering to be Sheamus’ new tag partner (since they’re both Irish). Sheamus didn’t appreciate Titus and shoved him into a table full of food. When they both came to the ring for the match, Titus attacked Sheamus outside the ring in a very convincing show of anger and aggression. Of course, Sheamus still wanted to have the match, and the match ended very quickly. Corey Graves is in the ring, ready to conduct an interview with Seth Rollins. But first, introduces a video chronicling the history between Rollins and Triple H. After the video, Rollins heads to the ring. He’s walking with a crutch, a knee brace, and a huge limp. 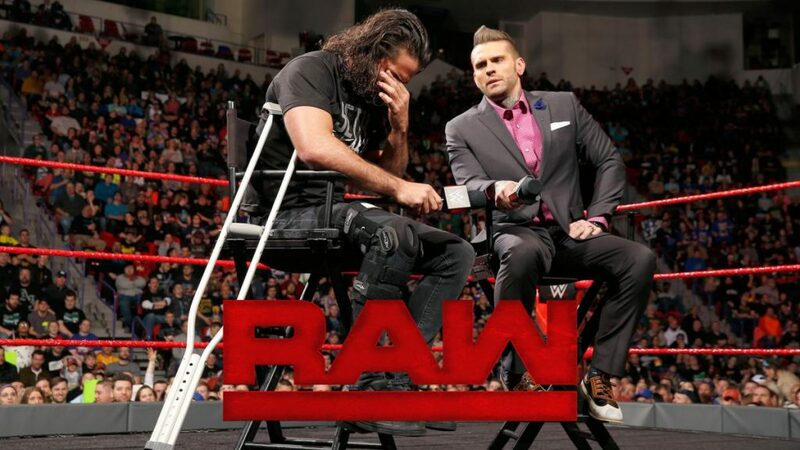 Graves asks Rollins how rehab is going. Rollins says it’s fine. It’s not a good time, but he’s getting better. Mentally, he’s having a rough time. He’s wondering if he made a mistake by aligning with Triple H. Graves asks Rollins about missing Wrestlemania again this year. Rollins says the doctors probably won’t clear him to compete in time. Triple H then heads to the ring. He has a huge smile on his face. Triple H says he’s glad to see Rollins. Samoa Joe appears at ringside, and he also seems happy to see Rollins. He also tells Rollins that he will not be at Wrestlemania, regardless of what anyone says. Triple H talks about how he made Seth Rollins champ, but Rollins turned on him. Rollins was the future, but now he’s the past. Washed up, beat up, and worthless. He warns Rollins to not show up at Wrestlemania, and not to call him out. Triple H’s speech seems to have convinced Rollins to definitely be at Wrestlemania. He has nothing left to lose. It was a pretty easy night for Big Show. The Shining Stars tried to put up a fight, but nothing worked. This was quick and one-sided. Honoring Martin Luther King Jr. for Black History Month. Neville makes it clear to Tony Nese that the purpose of their tag match is to put Jack Gallagher in his place before his title defense on Sunday. Tony Nese says he’s going to do what’s best for himself. This wasn’t much of a match. In what little action there was, Neville was singularly focused on Gallagher. This led to both teams having trouble working together. The ending was a little odd, mostly because of motivation for the actions (or rather, inactions). Beth Phoenix will be inducted into the WWE Hall of Fame. Bayley and Sasha are hurting after their tag match. They complain about Charlotte, and Sasha says she’ll be ringside during Bayley’s match at Fastlane. Stephanie McMahon comes up and stirs the pot. She also tells Sasha she’ll have a match on Sunday against Nia Jax. No surprise that this was good. It was short, but being short worked for this one. Cesaro tweaked his knee early in the match, and Joe attacked the knee relentlessly after that. Cesaro still managed to pull of some impressive power moves, but the end felt inevitable here. A good match for both guys, but a very good match for Joe’s character. After the match, Charly Caruso asks Joe about his impact on RAW. Joe says he came here to hurt people. He starts to address the entire locker room when Sami Zayn attacks Joe from behind. The two brawl around the stage area. Security tries to break them up, but Zayn dives from the stage onto Joe. Eventually they’re separated. Mick Foley is in the ring and ready to officiate the contract signing between Braun Strowman and Roman Reigns. Strowman interrupts Foley as he’s announcing the particulars of the contract. In the ring, Strowman tells Foley to leave the ring. Or else. Foley is tired of being talked down to. He yells at Strowman about being a legend. Strowman will respect Foley. Or else. Strowman knocks the mic from Foley’s hand when Reigns’ music starts to play. Reigns walks to the ring, and Strowman meets him at ringside. The two brawl around the ring and into the crowd. Reigns spears Strowman through the barricade, then he heads into the ring. Strowman joins Reigns in the ring and throws him into the corner. When Reigns hits the turnbuckles, the top one pops off, prompting Cole to scream about it “exploding.” It would have been an okay moment, but Cole’s overselling really makes me like things less than I probably should. Anyway, Strowman walks away, and Reigns signs the contract. What sounds more boring than Braun Strowman wrestling Roman Reigns? A contract signing between those two. That segment was the finish of a so-so show. There were a few decent matches, but they were all very short. None of the story stuff was particularly compelling, though I liked the Sheamus/O’Neil bit as well as the Cesaro/Joe stuff. Overall, this wasn’t a great final RAW before a PPV, but I’m not terribly excited about Fastlane anyway. I’m sure it will be fine, but it seems to be overshadowed by Wrestlemania and even Elimination Chamber (even though that show was only pretty good). I’d be perfectly fine if Fastlane got dropped next year. They need fewer PPVs anyway. It was mostly a storyline match and it was pretty short, but it was the best of the night. The matches were all short tonight and felt very much like they were holding everyone back just prior to the PPV. Also, it’s getting close to Wrestlemania, so playing it a little safe so people don’t get hurt is probably a good idea. This match might have been short, but it worked very well in the time it was given.